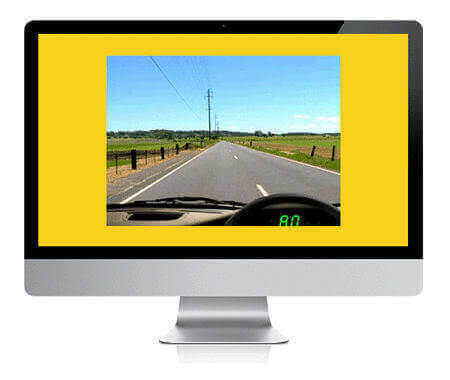 The hazard perception test is a computer based video assessment that you take at a Vicroads office. It tests your ability as a driver to notice dangerous situations as they are developing and to react within an appropriate time. As part of the process of getting your licence in Victoria you are required to pass the hazard test before you can attempt the on-road assessment. To increase your likelihood of passing it is important you obtain appropriate driving experience to improve your hazard perception skills. It is also helpful to understand how the testing process works. Starting with your very first driving lessons your instructor will help you develop an overall hazard awareness. Regular driving in a variety of conditions will also improve your ability to notice developing situations. During your driving test practice lessons your instructor will continue to look for ways to improve your hazard perception and situation awareness. The Vicroads Hazard Perception Test was introduced to the licensing process in 1996 to add an extra level of assessment to new drivers. While there may be some debate over its validity and effectiveness it does provide a way for Vicroads to identify new drivers who need more exposure to challenging driving situations so they are better prepared for independent solo driving. Hazards come in many forms including other road users, stationary objects or driving conditions. With lots of practice and experience in a wide variety of traffic conditions our ability to detect hazards improves and allows us to safely adjust our driving to avoid a collision. This is called hazard perception. Hazard perception skills develop over time. As a new driver you may not always recognise hazards straight away or it may take longer to interpret the hazard and react safely. The more you are exposed to hazardous situations the better you are able to identify and manage potential hazards. This is why newer drivers are at a higher risk of being involved in a collision than more experienced drivers who are often more aware of changes in their driving environment. Whilst hazard perception skills will improve with exposure to challenging situations, you can increase your ability to detect and react to hazards by implementing a few tasks in your everyday driving. Payment must be made at the time of booking an appointment and can be made by cash, EFTPOS or credit card if done at a Vicroads office. Only Mastercard or Visa is accepted for online and phone bookings. How can you get ready for your Hazard Perception Test? With plenty of exposure to a variety of driving conditions the hazard perception test is not too difficult to pass. If you are learning to drive in Point Cook, Werribee or nearby suburbs our training will assist in developing skills to help with the HPT. To be better prepared it is worth doing some practice examples so you know what to expect. Unfortunately Vicroads currently don’t have their own online practice hazard test available. The Victorian government does offer the Drive Smart website to assist with educating new drivers but is is very general in its content. As part of our commitment to providing access to a range of training materials for our western suburbs driving school customers we have a convenient link to a free practice hazard test. This is provided by the “MyLicence” website and is very similar to the Hazard Perception Test used for Victorian licensing. MyLicence is the SA government website providing information for licensing and road safety similar to Vicroads in our state. Don't waste time and money on driving schools that aimlessly take you on a tour of the backstreets. Our expert instructors will take your driving awareness to a higher level. If you are getting ready for your hazard test and this information has been helpful you may find our other articles useful as you get closer to solo driving. For our new drivers under the age of 21 who are required to complete 120 hours of driving be sure to read our guide to avoiding logbook mistakes. If you would like to know a bit more about how the practical assessment will be conducted we provide access to the Drive Test Criteria to assist with your preparation. And remember we are waiting to hear from you to give you the best training to get your licence in Werribee, Hoppers Crossing, Point Cook and surrounding suburbs. Contact us today and let us help take the stress out of your driving practice. Eclipse Driver Training helps drivers throughout the western suburbs improve their skills in readiness for solo driving and licence assessments.